HAuNTcon kicks off the 2015 convention season with a bang! Sponsored by Gantom Lighting and Controls, HAuNTcon will be in Baton Rouge, Louisiana February 6-10th, 2015 at the Belle of Baton Rouge Hotel and Convention Center. Over 50 hours of education, haunted house tours including 13th Gate, which is known as one of the top haunted attractions in the country, trade show floor filled with exhibitors, networking, and much more all crammed into the annual conference! Open to haunters of every level, HAuNTcon brings people who love Haunted Houses, Halloween, and scaring people, together for five fun-filled days and nights of Haunt Tours, Education, Tradeshow, and Networking. The convention is rounded out by a Haunted Garage Sale and the Annual HAuNTcon Costume Ball! Moving to a new city every year allows HauNTcon to offer off season tours of area haunted houses for attendees. Haunt tours allow haunt owners, home haunters, haunt actors, and Halloween enthusiasts an off-season look at pro-haunts both in full operation and lights-on backstage. HAuNTcon literally hits the road running on February 6th with the “Pre-show Inspiration Tour”, a bus tour of Louisiana’s best and most unusual haunts and attractions. While some attractions will be staffed with actors in full October mode for your “fright-tainment,” attendees will also get a once in a lifetime opportunity for a behind-the-scenes look during backstage lights-on tours. Pre-show tour tickets include transportation, meals and tours of a many diverse offerings; from behind the scenes of the highly detailed Rise Haunted House (featured in the movie The Houses October Built) to the creepy St. Louis Cemetery No. 1. This year will also feature a walking tour along Bourbon Street and a backstage tour of Mardi Gras World where famous floats are made for not only Mardi Gras, but parades all over the world! Without time to even catch a breath, the HAuNTcon schedule continues Friday night with the Kick-off Haunt Tour at 13th Gate and Necropolis 13. The Haunt Tours are rolling again on Saturday with tours of Rise Haunted House and Zombie Paintball. Monday night buses will take guests to The Mortuary Haunted House for a tour and the wrap party! Haunter Education is a key component of HAuNTcon. Classes begin early Saturday morning running through-out Tuesday afternoon. Over 50 hours of Education offered during the convention is FREE WITH SHOW ADMISSION! Creative Sessions, Business Seminars, Hands-on Workshops, Make Up and Product Demonstrations are all designed to provide cutting edge information and tips and tricks to show attendees ways to do what they do better, faster, easier and cheaper. Instructors include haunt industry notables such as Robert Kurtzman of Creature Corps, Ross Karpelman and Jay Gracianette of House of Shock, D’Ann Dagen of Hangman’s Haunted House, Quan Gan of Gantom Lighting and Controls, Chris and Jeff Davis of Davis Graveyard and so many more! As if all these speakers were not enough, HAuNTcon offers a set of Advanced All-day Hands-on Workshops on Tuesday February 10th. Coinciding with the Education, HAuNTcon offers a “Cash and Carry” Tradeshow Saturday and Sunday. Attendees can get a head start on purchasing and placing orders for the industries NEWEST haunting products and services. 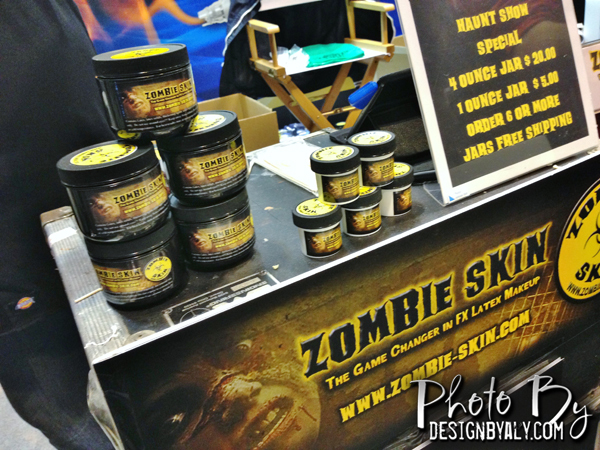 Since HAuNTcon is in February, many of the vendors will be releasing their 2015 product lines on the show floor! Quality Haunt Vendors like Gantom Lighting and Controls, Creature Corps, Froggys Fog, Store of Doom, AEO Studios, Inc. to name a few, will be selling the latest in animations, makeup and props; many at wholesale prices! 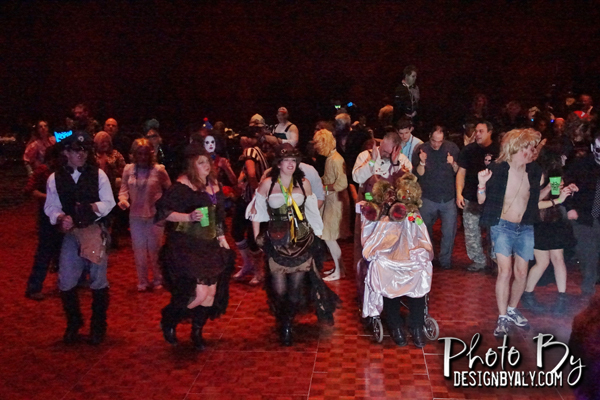 HAuNTcon’s signature event is the annual Costume Ball. This upscale party on Sunday night gives people who are normally working in October a rare chance to get into costume and celebrate Halloween with friends and family. Haunt owners, actors, makeup artists, and Halloween fanatics from around the world will be in attendance for an evening of partying, networking, and ghoulish fun. Sponsored by Froggy’s Fog, this year’s spooktacular will ensure that frightfully decked-out guests celebrate the industry in style, with party favors, prom photos, a Cajun buffet, free beer and soft drinks. A DJ and a dance floor will keep the festivities rocking throughout the night, (costumes are suggested but not required). Haunters eagerly anticipate HAuNTcon each year for it’s Education, Haunt Tours, Networking and Show Floor. 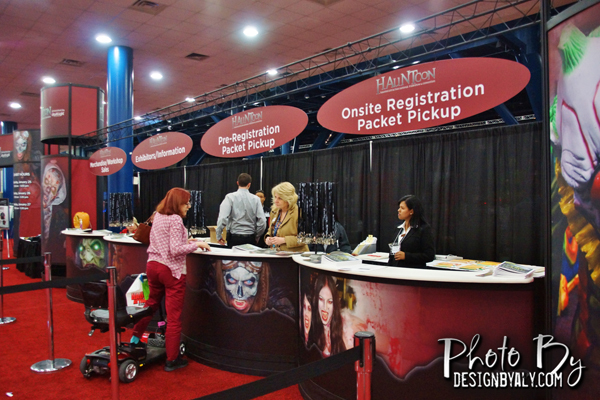 From its first year in 2004, HAuNTcon has listened to attendees and exhibitors, and made changes to tailor the conference to what the haunt industry needs. If you own, operate or work for a Halloween event or even just dream of having one someday; if you’re a haunt actor, makeup artist, prop builder or just love Halloween, attending HAuNTcon is THE BEST investment you can make towards fulfilling your Haunting dreams. See – 4 Haunt Tours featuring one of the top haunts in the country. Join – like minded haunters at HAuNTcon 2015, Baton Rouge February 6-10. For more information and to register, visit the official HAuNTcon website by clicking here!